Ford's second-quarter profit margin fell to 5.9 percent from 7.7 percent in the same period a year ago. DETROIT -- Ford Motor reported second-quarter net income of $2.04 billion, up 3.7 percent from the same period a year ago because of a favorable tax rate. But pretax profits fell 16 percent to $2.51 billion thanks to higher steel costs, an unfavorable foreign-currency exchange rate and other factors. Revenue rose 0.9 percent to $39.85 billion. Ford's tax rate was only 10 percent in the quarter, much less than the 30 percent analysts had anticipated. The automaker took a $248 million charge in the quarter for a decision to drop Focus sedan production in South America. The company is moving North American output of the Focus to China in 2019. 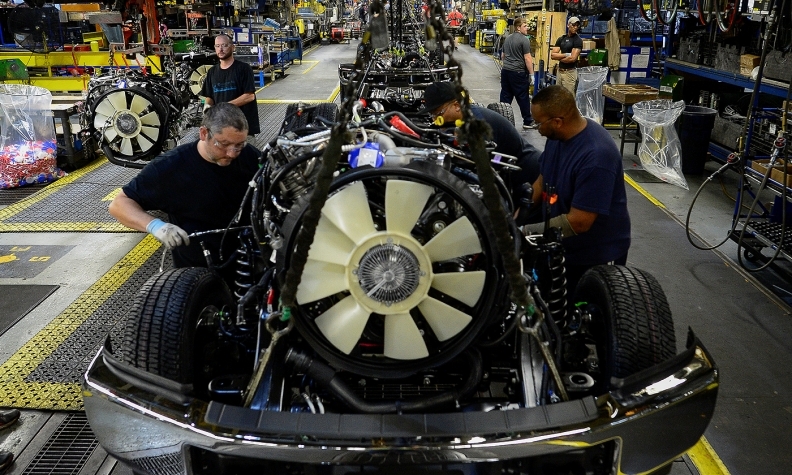 "This quarter shows the underlying health of our company with strong products like F-Series and commercial vehicles around the world, but we have opportunity to deliver even more," Ford CEO Jim Hackett said in a statement on Wednesday. "The entire team is focused on improving the fitness of the business and smartly deploying our capital to improve both the top and bottom lines in the quarters ahead." Ford's second-quarter profit margin of 5.9 percent dropped from 7.7 percent a year ago. Adjusted earnings were equal to 56 cents per share, up 4 cents. That topped analysts' estimates of 43 cents per share. Nearly all of Ford's profits were generated in North America. It generated a $2.2 billion pre-tax profit in the region, down 19 percent from the same time a year ago due to lower fleet volume. Ford earned $143 million in the Asia Pacific region, versus a small loss a year ago, driven by higher volumes in China. Ford also was profitable in Europe, though its $88 million pre-tax profit there was 81 percent lower than a year ago. It was Ford's ninth consecutive quarterly profit in Europe. Ford lost $53 million in the Middle East and Africa and $185 million in South America. At Ford Credit, second quarter pre-tax profit jumped 55 percent to $619 million. It was the credit arm's best quarter since 2011. Ford increased its earnings guidance, although it changed how the figure is reported. It previously said it expects to earn a pre-tax profit of $9 billion, down from $10.4 billion in 2016 as it invests in "emerging opportunities" such as autonomous and electric vehicles. That translated to an adjusted earnings per share of $1.58 per share. Ford now says it will end the year with an adjusted earnings per share of $1.65 to $1.85, thanks to an improved tax rate. The automaker would not offer a pre-tax profit prediction, although CFO Bob Shanks said the new guidance would translate to "a little bit less" than the $9 billion it previously forecasted.